Looking back at my recipes, I realized I haven’t written about yet another soy product that pops into my kitchen now and then – Tempeh. 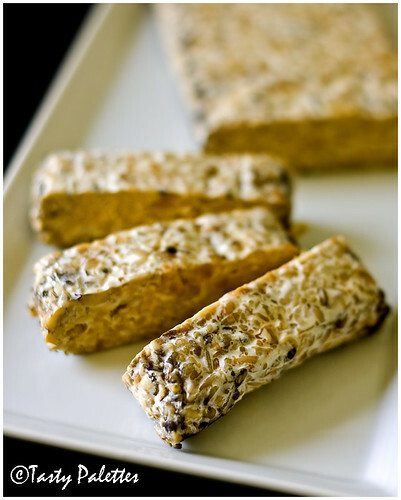 Originating from Indonesia, tempeh is prepared by fermenting soybeans with a starter. More about it here and here. For a vegan product, it may look strange. Its distinct nutty taste and grainy texture may require some getting used to. The first time I tasted tempeh, I felt it was too harsh for my palette. I reverted back to tofu, gained knowledge on how to spice up tofu products, and only then got on terms with tempeh. In due course, its nutty taste was sought after, and naturally, I got creative in cooking with it. Its high protein content was an added bonus. Also, they stand up to strong marinades, making them ideal for make-ahead meals. Keep them marinated, and make a sandwich as given below. Or add to stir-fries in place of tofu. Or grind with vegetables for croquettes. 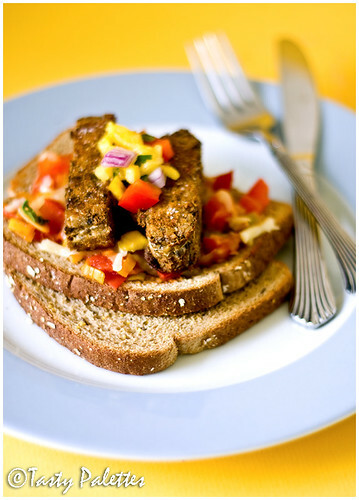 Our favourite tempeh marinade is Jamaican jerk seasoning. I buy this brand of Tempeh, as it is the only available one. I have tried almost all the flavours, and frankly, there isn’t much difference once it is coated with spices. Also, I have used a ready-made Jamaican jerk blend (as used in this recipe). The ingredient list includes ginger, brown mustard seed, onion, allspice, garlic, hot paprika, thyme, fennel seed, black pepper, red pepper, cloves. 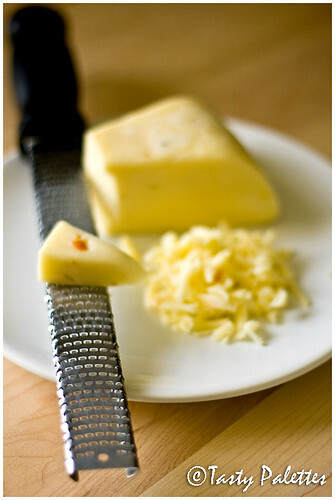 If you are a pepper jack fan, like me, then this should grab your attention – Habanero jack cheese, my latest craze. I just couldn’t resist from buying when I saw this at Whole Foods. It lives up to its name, quite a spice kick. Make the marinade by taking all the ingredients in a blender and grinding to a smooth mixture. Sprinkle water, if necessary, to make a loose paste. Coat tempeh slices in the marinade and let rest from at least 30 minutes to overnight. When ready, preheat oven to 350F. Line a baking sheet with foil, lay the slices side-by-side. Bake for 25-30 minutes, turning the slices once in-between. To prevent tempeh from drying too much, you may cover the slices with foil, but I didn’t. 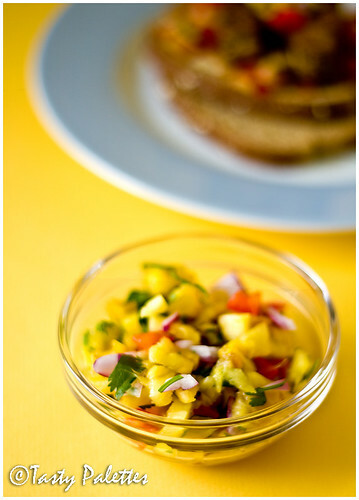 Meanwhile, prepare pineapple salsa by mixing all the ingredients and let the flavours develop. Also, prepare the spice spread by sautéing the listed ingredients, over low flame. The onion and tomato should become soft. Keep the mixture warm. When tempeh slices are done baking, toast the bread slices. Apply the spice spread and immediately sprinkle with cheese. The heat from the spread will slightly melt the cheese. Top with 2 slices of tempeh, and another slice of toast. Serve pineapple salsa on the side. Omit cheese for a vegan sandwich. Spiced, hearty tempeh, with habanero cheese, and tangy pineapple salsa – myriad of flavors. Off it goes to Sangeeth of Art of Cooking Indian Food, who is hosting Eat Healthy - Protein. wow! great entry dear...lovely pics....thanks for sending it to eat healthy contest! Sure worth a shot since TH loves sandwiches! Looks yum. Good one Suganya. Excellent recipe and superb pictures.Nice to know about Tempeh. Gorgeous pictures Suganya. I like tofu too, but never tried tempeh, for no particular reason. Wonderful Sandwich. I haven't tried Tempeh yet. Pineapple salsa is a nice twist. great entry suganya! and the pics are mouth watering as usual! Haven't yet tasted Tempeh..Pineapple salsa looks very nice..
You are right tempeh is strong tasting, you certainly make it looks very delicious. Can we add you to our blogroll? that looks fantastic, makes such a delicious workday sandwich. Thanks! I have recently gotten my mom hooked on tempeh. I'll have to share this recipe with her. She'll love it! Thanks, Suganya. Wow that such a lovely food with nice pics. I love tempeh, Suganya. Your marinade sounds delicious. I've only heard of tempeh but never had it. Oh gosh! I too love the Habanero jack cheese. It's so good isn't it? And I am not a cheese lover!